I saw this movie on Sunday at our local drive in. I took the kids I was watching to see it. I had high expectations for this film. I don’t know why. I thought it would be funnier. But it was not. It was actually really boring and the storyline was rather predictable. It was definitely not worth seeing. The snails looked cute though! Lol. Well, my expectations for this movie are quite low, so I’m sure I won’t be disappointed. I’ve seen the trailer a number of times at the theatre and it just didn’t look that great. I’m sure we’ll see it on DVD, but probably going to pass on this one at the theatre. Yeah, it is doing worse than The Croods in both areas (The Croods was not even doing that great critically to begin with), and it opened in like 3rd and 4th this weekend. It does seem predictable. I wonder if I am going to like it when I end up reviewing it. Well, “The Croods” is actually a huge commercial success! But, “Turbo” just is losing both commercially and critically! 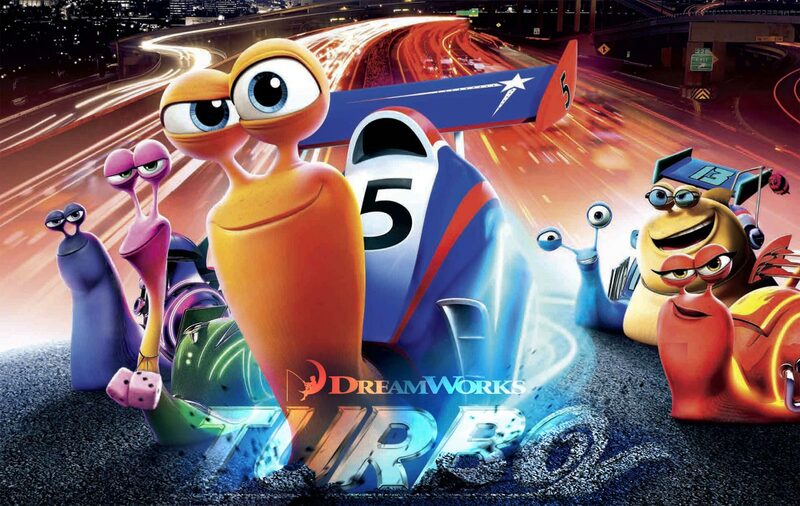 My policy for DreamWorks movies is to wait for the reviews…and since the first review I saw so far said “It’s a Cars rip-off”, I will give it a pass. I like Cars, but that doesn’t mean I want to see a dreamworks version of it. Somehow this is a really bad year for movies…all the hopes seem to rest on Frozen now. It looks like the only movie left in the line-up with the potential to be something really worthwhile. I wish Disney would step up on their “Frozen” publicity. But yeah, “Frozen” is my second-most anticipated movie of the year after “Saving Mr. Banks”. Yeah, a DreamWorks version of Cars would be disastrous. Monsters University was a tiny bit disappointing to me, but I feel like it will either be this or Frozen for Best Animated Feature. This year in animated movies is similar to 2011. When I saw the trailer, I had no interest. If anything, this is a Netflix pick for me. I don’t think I will be seeing for a long time. I feel like it kinda has been done before with racing (Cars). The only thing changed is that they are Snails haha.